On the last day of April the Hungarian Faktoring Associaton held its Annual General Meeting approving its final annual accounts and renewing mandate of its members. Ferenc Csáki, CEO of Magyar Factor Zrt. was re-elected as President and with the exception of one member the former Board continues to direct the Association. Gabriella Rédei, CEO of Next-Faktor Zrt. was re-elected as Vice President of the Board, the former-new members are Anna Bali, Executive of Primátus Zrt. and Tamás Molnár Executive of MKB Bank. A new member of the Board is Zsolt Major-Maróthy, CEO of CE Faktor Zrt. For the first time in their modern history, the services of factoring accounts receivables faced a 10% market reduction. In spite of this the HUF 750bn gross factoring turnover has grown threefold in the last six years and according to the estimates of the Association this amount is equivalent to the 10% of short-term bank-loans to the SME-sector. This clearly signals that factoring is far from being a group of marginal financial service, on the contrary, it is a substantial constituent of short-term financing services. It remains to be one of the main objectives of the Association to create a financing background to our natural clients, the SMEs, where we can foster their growth and help them strengthen. In accordance with this, the Association takes an active part in preparing for the modification of regulations concerning small and middle-sized companies, e.g. searching for ways to reduce ’chain debts’. For years it has also been our principal objective to establish a program subsidizing interest based on EU-resourses for those micro and small companies which can survive with the help of lower factoring fees. These resources could help enterprises which – in spite of the financial crisis – have potential markets and would be able to grow but cannot obtain resources on account of the narrow-scale and expensive financing services of banks. Hopefully, such a program for the development of companies can be launched and operated in the near future. 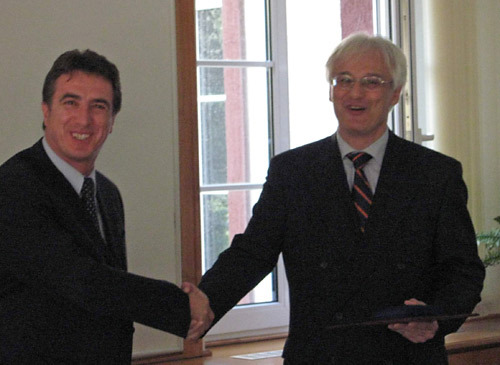 On the General Meeting of 23 09 2009 the Association awarded Károly Martinkó with the For Factoring Medallion. The award was handed over by Ferenc Csáki, president of the Association. In this manner the members recognized Károly Martinkó's outstanding achievement in the foundation of the Associaton, in defining its activities and in the development of factoring services. Protection against default in payment by the debtors. Interest charge, commitment fee, withdrawal fee, interest on arrears, etc. Factoring fee, due diligence fee, contracting fee, contract amendment fee, contract termination fee, e-factoring fee, fee of reporting on ledgered receivable, etc. Collection:- VAT taxable. The following items are to be listed here: factoring fee, notices, fees of non-litigious and litigious proceedings, collection commission, debtor due diligence fee, up-to-date information on debtors, forwarding charges of cash flow or flat rates covering them. Protection against debtor default in payment– VAT taxable. The following items are to be listed here: risk charge, credit insurance charge, due diligence fee, limit modification fee etc. „Out of the above listed elements of services – on the basis of its content - the service referred to in point 1)can belong to the financial services listed in VAT Act points b)-f) of Subsection (1)of Section 86. and the services listed in points 2)-4)….. are taxable at standard rate. On the basis of the aforesaid…factoring as defined by the Unidroit Agreement , and taking into consideration that it can never be solely regarded as finance (since it has to contain at least two of the above listed elements of services)is a complex transaction in which the fees paid by the client to the factor are billed burdened with 20%VAT rate. At the same time factoring typically consists of financing element too, which element, - considered individually – would be tax free service on the basis of the VAT Act point d). Subsection(1) of Section 86.